Many characterize Utah through its highly religious foundations – over 60% of its population identifies as part of the Church of Jesus Christ of Latter-Day Saints – as well as the second-fastest growing state in the nation. Through population growth and a business atmosphere promoting tech companies, Utah has attracted many manufactures and technology producers, exporting a great deal of these materials annually. Technology culture notwithstanding, Utah finds itself coming back to its roots as a mining town in many respects, including national investment in the stock of Utah’s silver, copper and beryllium. Utah’s own Interstate-70 is considered by many to be one of the most deserted highways in the entirety of the United States road system. With its captivating Wasatch Mountains, five national parks, seven national monuments, acres of lakes and reservoirs, canyons and ski resorts, such as the infamous Park City with its Sundance Film Festival each year, Utah is a stunningly beautiful state with a strong tourism industry for that reason alone. Rich in natural resources, Utah has long been a leading producer of copper, gold, silver, lead, zinc, potassium salts, and molybdenum. Oil and natural gas have also become major products. 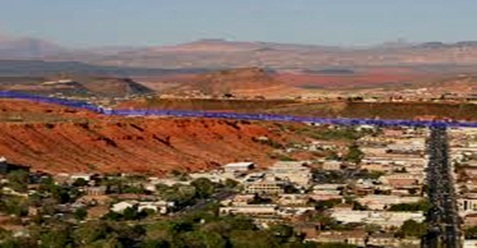 Utah is the only state that produces gilsonite, a pure form of asphalt used in dark colored printing inks and paints, and a wide variety of chemical products. The state's top agricultural commodities include cattle and calves, dairy products, hay, greenhouse and nursery products, and hogs. Utah has also become a center for aerospace research and the production of missiles and spacecraft as well. With Utah's central proximity to so many major cities in nearby states and major highways connecting to everywhere across the US, Utah transports a massive amount of goods both within and out of the state. In 2010, trucks transported 87 percent of total manufactured tonnage in the state or 196,775 tons per day, a number that has only increased with the economy rebounding over the last few years; a growing economy with more goods to be transported and more populated communities relying exclusively on trucks for their every day essentials. The trucking industry is the backbone carrying the economy forward and in Utah, there aren't enough truck drivers to even keep up. In 2011, the trucking industry in Utah provided 61,440 jobs, or one out of 15 in the state with an average annual trucking industry salary of $43,899. A number well above the national average and certainly enough to live a comfortable life in Utah, but it no longer seems to be enough to attract or retain truck drivers. Utah trucking companies have been forced to offer higher wages or try different approaches such as C.R.England, a Utah based trucking company also operating driver schools in the U.S. They now offer to refund tuition to graduates after they work six months for the company in addition to paying their regular wages. Tom Pronk, vice president of recruiting for C.R. England in Salt Lake City also stresses that many drivers quickly work up to earning more than $57,000 per year and some get up to clearing up to $100,000. Utah is obviously ripe with truck driver jobs, but where do you find all the available jobs to shop and compare which ones are best suited for you? That is where TruckDrivingJobs.com comes in, with our on-line job board giving you access to the most current truck driving positions all over Utah State. Once you determine your wish list of the best jobs to focus on, TruckDrivingJobs.com helps you take the next, most important step to making your dream job come true. Our on-line application process immediately links you to the hiring employers and even from your computer at home, your truck driving job in Utah is already underway. Below are list of companies currently hiring within utah. Call 435-623-0776Based out of Rocky Ridge Town, A & W Development owns 347 trucks and primarily transports Logs, Poles, Beams, Lumber, Building Materials, Construction equipment. Call 435-462-2812Based out of Mt Pleasant, J & C Transportation owns 243 trucks and primarily transports regular Flatbed & Reefer loads, various metals such as Brass, Titanium, Copper, Iron, Building Materials, Fresh Produce, Petroleum Gas & Natural Gas, Meat, Chemicals, Refrigerated Food, Beverages, Paper Products. Call 801-726-8436Based out of Mt Green, M D Transportation owns 175 trucks and primarily transports regular Flatbed & Reefer loads, various metals such as Brass, Titanium, Copper, Iron, Car hauling, Reposession & Towing, Logs, Poles, Beams, Lumber, Building Materials, Machinery, Oversized loads such as Farm Mining or Oilfield equipment, Fresh Produce, Oilfield Equipment, Livestock, Grain, Feed, Hay, Meat, Dry Van, Refrigerated Food, Beverages, Paper Products, Farm Supplies. Call 801-244-9493Based out of West Bountiful, A & B Transportation owns 969 trucks and primarily transports regular Flatbed & Reefer loads, various metals such as Brass, Titanium, Copper, Iron, Logs, Poles, Beams, Lumber, Building Materials, Machinery, Oversized loads such as Farm Mining or Oilfield equipment, Fresh Produce, Intermodal Containers, Oilfield Equipment, Livestock, Grain, Feed, Hay, Coal, Coke, Meat, Garbage, Refuse, Trash, U.S. Mail, Dry Van, Refrigerated Food, Beverages, Paper Products, Farm Supplies. Call 435-946-8844Based out of Garden City, T B P Construction owns 115 trucks and primarily transports Logs, Poles, Beams, Lumber, Building Materials, Machinery, Oversized loads such as Farm Mining or Oilfield equipment, Construction equipment. Call 801-280-2142Based out of West Jorden, T K O Excavating owns 942 trucks and primarily transports Machinery, Oversized loads such as Farm Mining or Oilfield equipment. Call 801-420-2983Based out of Cedar Hills, A 1 Cut And Core owns 680 trucks and primarily transports CONCRETE CUTTING MAT. Call 435-882-4693Based out of Tooele, Fantastic Plastic owns 155 trucks and primarily transports PLASTIC HEETER PARTS. Call 435-458-3797Based out of Collinston, S David Earl owns 688 trucks and transports all kinds of freight. Call 435-258-2624Based out of Leviston, E I Farms owns 521 trucks and primarily transports Logs, Poles, Beams, Lumber, Livestock, Grain, Feed, Hay. Call 801-392-7733Based out of Riverdale, Quality Tree Service owns 101 trucks and primarily transports Trees foods. Call 801-301-5584Based out of Kaysville, Tri City Nursery owns 506 trucks and primarily transports regular Flatbed & Reefer loads, Farm Supplies. Call 801-745-1615Based out of Huntsville, Valley Construction owns 504 trucks and primarily transports Building Materials, Construction equipment. Call 801-375-3913Based out of Provo, A & C Cox Excavating & Construction Co owns 184 trucks and primarily transports Machinery, Oversized loads such as Farm Mining or Oilfield equipment, Construction equipment. Call 208-852-3963Based out of Nibley, M H D Brand Oration owns 384 trucks and primarily transports regular Flatbed & Reefer loads, various metals such as Brass, Titanium, Copper, Iron, Car hauling, Reposession & Towing, Logs, Poles, Beams, Lumber, Building Materials, Machinery, Oversized loads such as Farm Mining or Oilfield equipment, Livestock, Grain, Feed, Hay, Dry Van, Beverages, Paper Products. Call 303-870-3148Based out of Ft Duchesne, A J Sanborn owns 448 trucks and primarily transports Petroleum Gas & Natural Gas, Toxic Materials. Call 435-640-3468Based out of Park City, G-bar Landscape & Excavation owns 628 trucks and primarily transports regular Flatbed & Reefer loads, Household Goods, various metals such as Brass, Titanium, Copper, Iron, Car hauling, Logs, Poles, Beams, Lumber, Building Materials, Machinery, Oversized loads such as Farm Mining or Oilfield equipment, Grain, Feed, Hay, Garbage, Refuse, Trash, Farm Supplies, Construction equipment. Call 801-745-2309Based out of Eden, S & S Excavating owns 703 trucks and primarily transports Construction equipment, Toxic Materials. Call 801-731-2072Based out of Roy, C & L Transport Orporated owns 124 trucks and primarily transports regular Flatbed & Reefer loads, Household Goods, various metals such as Brass, Titanium, Copper, Iron, Car hauling, Logs, Poles, Beams, Lumber, Building Materials, Machinery, Oversized loads such as Farm Mining or Oilfield equipment, Intermodal Containers, Oilfield Equipment, Grain, Feed, Hay, Coal, Coke, Dry Van, Beverages, Paper Products. Call 435-587-3208Based out of Monticello, G Y Enterprises owns 479 trucks and primarily transports regular Flatbed & Reefer loads, various metals such as Brass, Titanium, Copper, Iron, Car hauling, Logs, Poles, Beams, Lumber, Building Materials, Machinery, Oversized loads such as Farm Mining or Oilfield equipment, Oilfield Equipment, Livestock, Grain, Feed, Hay, Construction equipment, Toxic Materials. Call 801-825-6688Based out of Clearfield, A & E Transportation owns 891 trucks and primarily transports regular Flatbed & Reefer loads, various metals such as Brass, Titanium, Copper, Iron, Logs, Poles, Beams, Lumber. Call 435-770-2105Based out of Benson, Falslev Livestock owns 215 trucks and primarily transports Logs, Poles, Beams, Lumber, Building Materials, Machinery, Oversized loads such as Farm Mining or Oilfield equipment, Fresh Produce, Livestock, Grain, Feed, Hay, Garbage, Refuse, Trash, Dry Van, Farm Supplies. Call 435-772-3636Based out of Rockville, Zozak Building Systems owns 270 trucks and primarily transports Logs, Poles, Beams, Lumber, Building Materials, STONE. Call 435-654-7007Based out of Wallsburg, Ogden Constructors owns 309 trucks and primarily transports Construction equipment, Toxic Materials. Call 801-876-2400Based out of Mountain Green, United Aquaculture Technologies owns 161 trucks and primarily transports Logs, Poles, Beams, Lumber, Building Materials, Mobile Homes, Machinery, Oversized loads such as Farm Mining or Oilfield equipment, Grain, Feed, Hay, Garbage, Refuse, Trash, Refrigerated Food. Call 435-848-5686Based out of Hanna, Fabrizio Sawmill owns 324 trucks and primarily transports Logs, Poles, Beams, Lumber, Machinery, Oversized loads such as Farm Mining or Oilfield equipment. Call 801-253-4914Based out of South Jordan, Ian David Cornish owns 154 trucks and primarily transports TOOLS. Call 801-985-1527Based out of Weber, H O S Excavation owns 671 trucks and primarily transports Machinery, Oversized loads such as Farm Mining or Oilfield equipment, Dirt building materials. Call 435-458-9152Based out of Fielding, S & B Excavation owns 336 trucks and primarily transports regular Flatbed & Reefer loads, various metals such as Brass, Titanium, Copper, Iron, Building Materials, Machinery, Oversized loads such as Farm Mining or Oilfield equipment, Construction equipment. Call 435-623-4734Based out of Mona, B C & T owns 412 trucks and primarily transports regular Flatbed & Reefer loads, Fresh Produce, Refrigerated Food, Farm Supplies, Construction equipment. Call 435-257-1962Based out of Tremonton, B C T I owns 413 trucks and primarily transports Grain, Feed, Hay, Dry Van. Call 801-768-8686Based out of Highland, A 1 Septic Tank Service owns 712 trucks and primarily transports various liquids NON HAZ Hazmat materials. Call 435-788-2142Based out of Lake Powell, Offshore Marina owns 475 trucks and transports all kinds of freight. Call 801-732-6512Based out of Farr West, B & K Fox Contractors owns 171 trucks and primarily transports Dirt for landfills. Call 435-653-2371Based out of Cleveland, F Alan Jensen owns 109 trucks and primarily transports Livestock, Grain, Feed, Hay. Call 801-280-9400Based out of West Jordon, M & M Asphalt Services owns 711 trucks and primarily transports regular Flatbed & Reefer loads, Building Materials, Machinery, Oversized loads such as Farm Mining or Oilfield equipment, Petroleum Gas & Natural Gas, ROAD SEALE. Call 801-245-4202Based out of Wellsville, M & W Trucking owns 969 trucks and primarily transports Building Materials. Call 435-654-2777Based out of Heber, A Boyd Duncan owns 960 trucks and primarily transports Dry Van. Call 801-298-4946Based out of North Salt Lake, D & L Enterprises owns 320 trucks and primarily transports Building Materials, Garbage, Refuse, Trash. Call 435-872-8217Based out of Snowville, Ocean Star International owns 673 trucks and primarily transports regular Flatbed & Reefer loads, Building Materials, Machinery, Oversized loads such as Farm Mining or Oilfield equipment, Passengers, Garbage, Refuse, Trash, BRINE SHRIMP EGG. Call 435-893-8485Based out of Central Valley, T W Hutchings Trucking owns 158 trucks and primarily transports regular Flatbed & Reefer loads, various metals such as Brass, Titanium, Copper, Iron, Logs, Poles, Beams, Lumber, Building Materials, Machinery, Oversized loads such as Farm Mining or Oilfield equipment, Grain, Feed, Hay, Farm Supplies, Construction equipment.